Region 9 successfully held a Bowling Tournament on February 23-24, 2019 at Transit Lanes in Williamsville, NY. There were approximately 140 bowlers who participated from 6 different locals out of PA and NY. During the tournament there was team play which had 18 teams of 5 who bowled on Saturday and the Singles games which included 50 bowlers on Sunday. Congratulations to Bill Young of Local 1326 who bowled a perfect game of 300 and Eric Johns of Local 774 who bowled a game of 299 - both on Sunday. 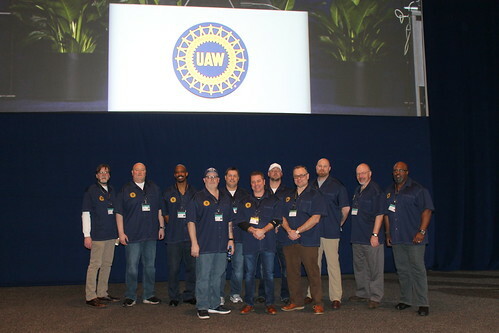 THE UAW'S ANNUAL WHITE SHIRT DAY HONORING THE ANNIVERSARY OF THE BRAVE MEN AND WOMEN WHO, IN 1936-1937 CREATED THE RECOGNITION OF THE UAW FOR THE FIRST TIME IN A STRIKE AGAINST GENERAL MOTORS IN THE FLINT SIT-DOWN STRIKE THAT ENDED FEBRUARY 11, 1937. EACH YEAR ON WHITE SHIRT DAY MEN AND WOMEN THROUGHOUT THE UAW WEAR WHITE-COLLAR ATTIRE TRADITIONALLY DONNED BY MANAGEMENT TO REMEMBER THE SACRIFICES AND VICTORIES OF WORKERS. TODAY, AND EVERYDAY, WE SAY THANK YOU FOR LAYING THE FOUNDATION OF THE MIDDLE CLASS AND WORKERS' RIGHTS.